Room 5 @Sunnyhills: My fantastic holiday! 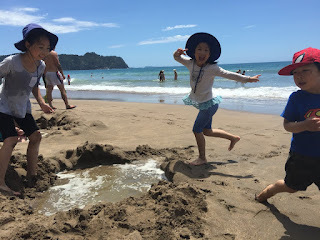 In the holiday, I went to Hot Water Beach with my family. My Dad told us there is hot water under the sand. So we tried to dig the big hole in the sand. It was really fun! I love Hot Water Beach. But you have to be careful, sometimes the water can be scorching, I burnt my foot there once. When you dug the big hole, was the water hot? Was the water hot in the big hole? Hot Water Beach is such an interesting place to visit Tiffany! The water can really burn your feet - it is a special 'Kiwi' experience.